I was supposed be on San Antonio’s River Walk for Easter 2008. But a disastrous combination of greasy food and Long Island iced teas rendered me incapable of driving. Since it was spring break, the campus was relatively empty, and this is when Davidson College is at its most beautiful. Outside, birds actually chirp, and you can hear the creaking of a makeshift swing on the huge oak outside of Duke Hall. So, even though I was missing family boat rides and Tex-Mex near the Alamo, I enjoyed a cool afternoon walk from my dorm to the Alvarez Student Union — the NCAA tournament was going on, and Davidson was playing Georgetown. Most of the students who’d stayed on campus gathered in the “900 Room,” a space for lesser guest speakers and weekend events such as Davidson Idol and karaoke, to watch the broadcast of the game. My tiny, relatively obscure school was trying to shock the world. Wardell Stephen Curry, “the guard the big schools didn’t want,” was two days removed from a 40-point coming-out party against Gonzaga University, but Georgetown — led by Roy Hibbert at center — seemed like the end of our short-lived and magical run: The Hoyas built a 17-point lead early in the second half. They were 14 up when Curry did something I’ll never forget: As soon as he crossed half court, he tossed the ball in the air toward the basket — it landed softly in the hands of 6-foot-6 Canadian Max Paulhus Gosselin for an alley-oop. He plays like an underdog who’s sure he’s going to overcome insultingly low expectations. It usually works in his favor. Who does that?! That’s what the curly-haired girl next to me yelled immediately after the play. Not a slam—but the layup galvanized our scrappy, undersized Wildcats, who stormed back to beat Georgetown by four on their way to the sweet 16 and eventual elite eight, becoming America’s sweethearts and launching Curry into the spotlight. I had the same question as the curly-haired girl: Who — on a team as flashy as a Grapes Of Wrath audiobook — has the guts to launch a half court alley-oop to a teammate not known for athleticism while down double-digits in the NCAA tournament? The answer is obvious now: the same guy who casually walks down an NBA basketball court and shoots 30-foot jumpers without thinking twice. I’ve thought about that Steph-to-Gosselin pass a lot. It was the first time I saw the guy who walks that edge between daring and reckless. When Curry launched the pass, it was pretty much assumed that Davidson was about to get bounced from the tournament. 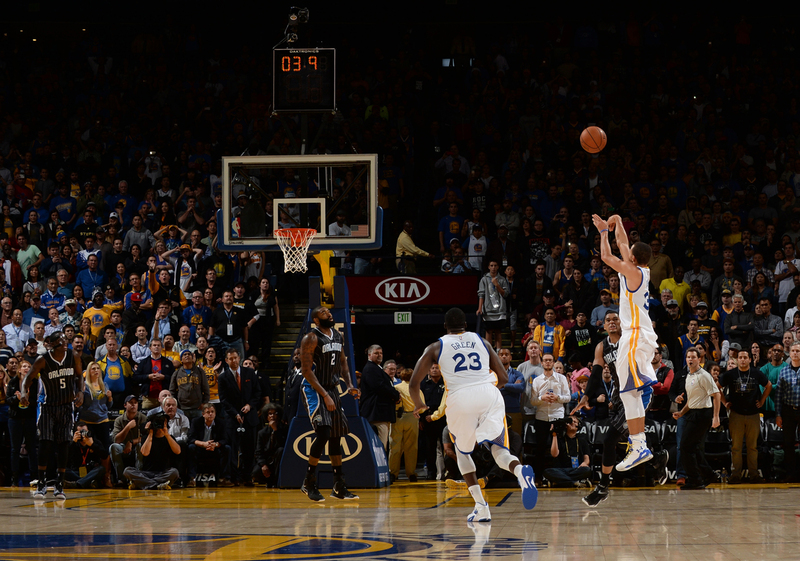 Stephen Curry #30 of Golden State Warriors takes a shot as time runs down against the Orlando Magic on December 2, 2014 at Oracle Arena in Oakland, California. So Curry really had nothing to lose. And when I watch him launch fadeaway 3s with 20 seconds on the shot clock after dribbling between four Los Angeles Clippers defenders as he infamously did last year, I see a guy who always plays as if he’s down 14 with little chance of winning. He plays like an underdog who’s sure he’s going to overcome insultingly low expectations. It usually works in his favor. Sometimes I wonder if, in the way basketball great Michael Jordan created slights or disrespect to find his motivation — as in ’95 when he let a Vancouver Grizzlies benchwarmer irritate him into scoring 19 points in six fourth-quarter minutes — Curry subconsciously creates scenarios in which he believes that people underestimate him, so he can rise above the disrespect of the underestimation. It would explain how the Golden State Warriors went on two separate three-game winning streaks after being down 2-1 in twp separate 2014-15 playoff series. It would explain how he finished the 2015-16 season as the most improved MVP after people discredited the Warriors’ title run — Doc Rivers most notably calling them “lucky” they didn’t have to face the San Antonio Spurs or Clippers in their championship run. And it would explain the 67 points over two games after Russell Westbrook laughed off a reporter asking about Curry’s defense — a move everyone knew wouldn’t go unpunished — and their chances at coming back to win the series. And this would also explain the Warriors’ ability to obliterate teams in fourth quarters after letting themselves trail for most of the game. Curry thrives on the underdog status and he enjoys proving people wrong. Don’t think it was an innocent coincidence that Curry laughed his way down the court after crossing Kevin Durant and laying the ball up over Westbrook’s outstretched fingertips in the waning seconds of the Western Conference finals’ seventh game. It’s one of those many reminders that the Babyfaced Assassin has bite behind his nonchalant demeanor. Somewhere in New Orleans, there’s a middle-aged white lady with a really awkward picture of me and Curry. This was 2010, and I was waiting for him in the Smoothie King Center’s player meeting area after a New Orleans Hornets vs. Warriors game. The area is a glorified storage facility filled with friends of players and people looking for an autograph from anyone going from the team locker room to the bus. I’d heard the woman and her teenage daughter whispering, and then she came up behind me with “Are you Stephen Curry’s brother?” I wanted to let her know that all tall, light-skinned guys don’t look alike, but I just told her I wasn’t and laughed it off. I wonder if…Curry subconsciously creates scenarios in which he believes people underestimate him, so he can rise above the disrespect of the underestimation. When Curry finally came out, we had small talk about his season. It was his second in the NBA. We spoke about me routinely beating him in online Scrabble. How much we missed chicken Parmesan from Vail Commons, and how great it was we don’t have to pull all-nighters anymore. The woman interrupted us: “You two, stand together.” We awkwardly shuffled toward each other and stood there confused, wondering why we were taking this picture, and trying to smile through the weirdness. Curry signed a couple of autographs and boarded the team bus soon after. Over the years, I’ve waited after games in that same area when the Warriors are in town. The crowd waiting for Curry has of course gotten bigger each time. We rarely talk about basketball. There are enough people around him to talk basketball. Instead we talk about the important things. We’d talk about our families — he married Ayesha exactly a month after I was married, and his oldest daughter Riley is a couple of months older than my son. And we’d talk about Davidson. We’d always go back to Davidson. The well-known elevator speech about Davidson College: It’s a tiny liberal arts Division I school in a tiny town right outside of Charlotte, North Carolina. But what’s not widely talked about — but generally assumed — is that there aren’t a lot of Black people at Davidson. About 6.5 percent of the 1,800 students at Davidson were black when I was there, so we’re all at least familiar with one another. Black students tend to create a tight-knit community throughout their four years there. Stephen Curry #30 of the Davidson Wildcats shoots a free throw against the North Carolina State Wolfpack during their game at Time Warner Cable Arena on December 6, 2008 in Charlotte, North Carolina. When Curry got to Davidson my junior year, all I knew about him was that he was supposedly a good basketball player and he looked like he was in middle school. He didn’t come to Davidson with much fanfare because, well, we didn’t have much fanfare to offer. Steph was just Steph — a sometimes quiet, laid-back kid who’d joke around with friends and occasionally try to Crank That Superman on a given Saturday night. He was coming off the the embarrassment of a unanimous MVP selection that was impossible to live up to. Yes, Curry deserved to be unanimous MVP, just not the first one. But it didn’t take long to realize Curry was a special basketball player. Even though Davidson had always enjoyed success as a Southern Conference champion and NCAA Tournament participant, our home games were rarely packed, and students could just wander into the gym to find a good seat in the middle of the first half. That’s how I’d see most of Curry’s games: I’d meander in the middle of a monster game against Furman University or Elon University or any other midmajor school that had no clue what to do with his insane scoring spurts, which were very similar to what he does now. Two minutes would mean 15 points and a demoralized opponent. It was even funnier because his jersey looked like it was three sizes too big. The opposing team would call timeout and he’d run to the bench, jump in the air and give his roommate and teammate Bryant Barr a celebratory bump while the bench and crowd went crazy. The realization would sink into his opponents: We’re getting killed by someone who looks like a middle-schooler. It’s the same look NBA defenders give him now. Disbelief that someone so slight is able to terrorize a whole generation of defenders and defensive schemes. Naturally — in a move some still think works in the NBA — the opposing coaches would find a lanky, quick defender to guard Curry — a matchup that looked unfair. And that’s when Curry’s heart would show: He’d find a screen, use some shifty ball-handing and eventually find himself with enough air to launch a 3. Every Davidson student there would chant, “He’s a freshman,” then get our keys out, shake them and chant, “Drive home safely,” while the other teams left the court, shaking their heads in disbelief. After the games? Steph would just be Steph. He’d shrug off compliments, seemingly oblivious to what he’d just done on the court. It was easy for everyone to pretty much treat him like just another student. Is he tough enough for the playoff grind? Does physicality bother him? Is he a defensive liability? And can he regain the alpha dog status that James swatted out of bounds? Most NBA MVPs in the AAU generation are superstars from the time they’re in middle school. People are clinging to potential fame by the time would-be stars hit puberty. LeBron James was on the cover of Sports Illustrated while in high school. Curry was a fairly anonymous upper-middle class kid, especially in high school, and those first couple of years at Davidson. I’m not the only Davidsonian he seeks out around the country — especially in those early years of his career. I’ve heard from plenty of classmates who met him at arenas postgame to reminisce about simpler times. It must be good to just see a familiar face who Curry knows isn’t hanging around for a free pair of Curry 2s (the high-top version). Game 7 of the 2016 NBA Finals was a stage unlike anything Curry had ever seen. Last year’s Finals was a foregone conclusion by the end of Game 4, so the drama and pressure never reached the crescendo of its sequel. Last week, Curry was no longer the underdog. Instead, he was the bully. Curry was the leader of a juggernaut that even made James look like David throwing rocks at Goliath. It had become hard to imagine the Warriors losing — there were just so many games when these Warriors were up against defeat and still won. There was the 24-point deficit against the Clippers at the Staples Center they overcame to preserve their undefeated streak. In December, there was the heroic double overtime win in Boston to do the same. And the half court prayer from Curry to beat the Oklahoma City Thunder on Feb. 27. In the final week of the season, they came back from 10 down late in the fourth in Memphis to preserve 73 wins. Curry carried out an overtime explosion to beat the Portland Trail Blazers in Game 4 of the second round. Then there was Klay Thompson’s out-of-body Western Conference finals Game 6 in Oklahoma City to save their season. Stephen Curry #30 of the Golden State Warriors reacts after losing 93-89 in Game 7 of the 2016 NBA Finals against the Cleveland Cavaliers at ORACLE Arena on June 19, 2016 in Oakland, California. It just all worked out. Every one of those games was as improbable as it was a sign of championship resolve. Even down four, with 10 seconds left in the most watched Game 7 since 1998, it felt like the Warriors would somehow find a way to win. But eventually the run ends. 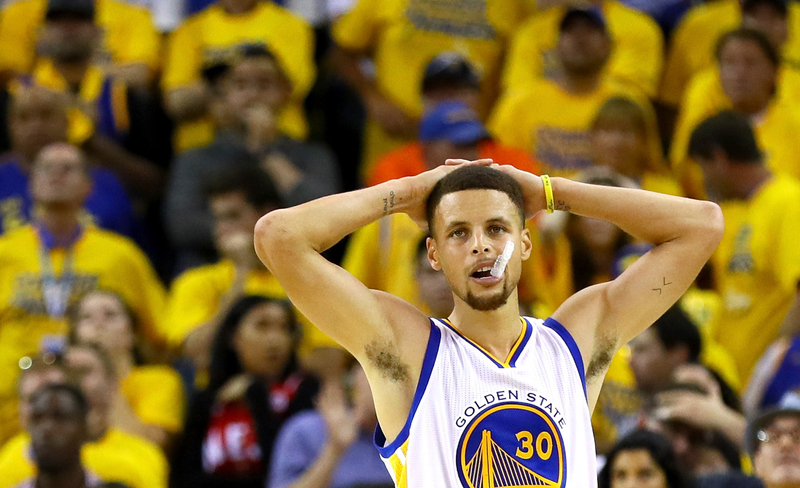 And importantly, unlike that tournament game against Georgetown, Curry had more than a lot to lose. There was a look in Curry’s eye when we talked about the game that I didn’t quite understand until much later. He was coming off the the embarrassment of a unanimous MVP selection that was impossible to live up to. Yes Curry deserved to be unanimous MVP, just not the first one. His season was phenomenal, but the unanimous vote became a twisted indictment of the great players who were previously shafted out of unanimous MVP awards. Michael Jordan, Shaquille O’Neal and James have all deserved it before him. But MVP votes used to go to players who “deserved a chance” as much as people who actually deserved to win. That would explain why O’Neal only has one MVP and Karl Malone and Charles Barkley each got MVPs during Jordan’s reign. In years past, journalists would make Brexit-like votes that were set to act as statements more than a reflection of who they actually thought should be MVP. That’s how New York Knick Carmelo Anthony ended up getting the sole non-LeBron vote for MVP in 2013. That’s how Philadelphia 76er Allen Iverson got the lone vote that kept O’Neal from being unanimous MVP in 2000. Curry benefited from simply not having lone dissenters this year. Maybe the MVP vote is becoming more accurate. Maybe Curry’s likability, good boy image and probable beloved status amongst voters’ kids stopped every trolling voter this year. Whatever the case, Curry’s unanimous MVP became a burden and a symbol of an award he didn’t quite deserve. Now the word “unanimous” became translation for “better than Jordan” and an achievement Curry hadn’t quite deserved yet. And it turned into a target for people to begin aiming at. Suddenly everyone remembered all the times he turned around before he made a 3-pointer. The dance moves after game-winners. The weird fetishization of his wife on Twitter. Then he struggled against Oklahoma City and by the time he reached the Finals, James and the Cleveland Cavaliers were the heroes and Curry’s Warriors were the villains. The word “unanimous” became an albatross — it was attached by every critic to every missed 3-pointer. This is an usual thing to witness — for someone who’s been watching Curry play since he was a Wildcat. He’s been the underdog his whole career. And it’s a hard-sell — telling anyone that Curry is humble. But he’s always demonstrated awe at each new level of stardom and accomplishment. We texted after his 54-pointer in Madison Square Garden, talked after his first gold medal and spoke after his MVP. He’s always treated these things like they’re unexpected, like he’s just as surprised as we all seem to be. And beyond the MVP, Curry was sitting on a herculean 73-win season — and the prospect of it all being for naught. Weighing on him also has to have been the overwhelming (and somewhat silly) notion that the Warriors’ excellence in 2015 was a result of just too many good breaks going their way: a perceived invalidation of their entire NBA championship run. It was all on the table. And when Curry’s behind-the-back pass to Thompson sailed out of bounds with five minutes left in the fourth quarter, the magic finally ran out. For the first time since I saw Curry score 25 points in the first half of Davidson’s Red and White intrasquad scrimmage to kick off his freshman year basketball campaign, things weren’t going his way on the court. That pass was when the fine line between carefree and daring finally disappeared. Even when his errant behind-the-back pass got stolen in Game 4, Thompson managed to block Cavalier Kyrie Irving’s subsequent layup, erasing the mistake. But in Game 7, things stopped working. On the biggest stage, the answers Curry usually finds in a timely 3-pointer, a sneaky steal or a perfectly placed pass to Thompson in the corner just didn’t come. I couldn’t jingle my keys at the TV or chant “Drive home safely” to James and Irving. Instead I just waited for that classic Curry dagger that never came. The Cavs won. And Curry began an offseason full of questions. Is he tough enough for the playoff grind? Does physicality bother him? Is he a defensive liability? And can he regain the alpha dog status that James swatted out of bounds? The last time I saw Curry in New Orleans, he was playing the Hornets a couple of weeks before All-Star Game 2013 and I was sure he was a lock to make his first appearance at the big game. He was averaging 20 points and six assists a game while shooting 45 percent from 3 and the Warriors were on pace for their first playoff berth in years. So naturally I gave him some early congratulations for making the team. Also I was going to be covering the game in Houston, so I wanted to let him know I’d be there watching him. Curry, always quick to downplay his success, refused to jinx it, and was quick to name other players who were also qualified. Curry did not make the All-Star team in 2013. But he did reach out, said, “Wanna roll to the game?” At the time, it was a surreal experience to see people asking Curry for his autograph as we walked to over from the player hotel to Houston’s Toyota Center. But looking back, it’s equally surreal to think that just three years ago, Curry was able to stroll across the street from the player hotel to the arena without causing a traffic jam. After the game, he was in good spirits despite the fact he knew he should have been in that all-star game. We laughed at some YouTube videos, joked about old times. I still felt awkward. I wanted to say something like “You’ll get em’ next year,” or, “You got robbed,” but he didn’t sell the snub like it bothered him. 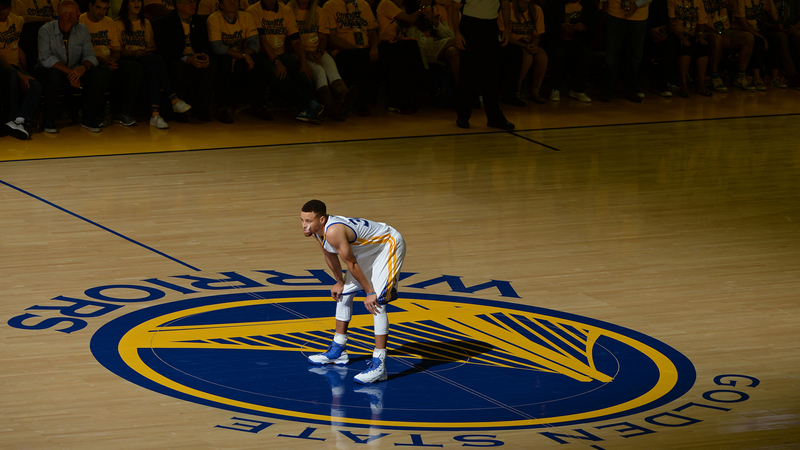 Stephen Curry #30 of the Golden State Warriors stands on the court during Game Two of the 2016 NBA Finals against the Cleveland Cavaliers on June 5, 2016 at ORACLE Arena in Oakland, CA. Still. There was a look in his eye when we talked about the game that I didn’t quite understand until much later. The NBA has a way of humbling its biggest stars and snatching away their innocent joy for the game. Oddly enough, many league fans around the world want to see these men come down to Earth. This happened in ’84 when the smiling, bright-eyed Earvin “Magic” Johnson choked away the Finals and became “Tragic Johnson.” Jordan went through it after his third straight loss to the Detroit Pistons in the 1990 playoffs, turning him from the score-at-will future of the league to the guy who was too selfish to lead a franchise to a championship. O’Neal went from entertainer extraordinaire to Finals sad story after his upstart Orlando Magic got swept in 1994. And James went from choreographed pregame routines with his teammates to league villain after his 2010 Celtics series, The Decision to leave the Cavaliers, and his inexplicable no-show at the 2011 Finals. All of these men had to eventually find their happiness in basketball again and become winners. Curry is middle of that same awful humbling process, this time on a stage bigger than any of those stars before him. While we all reach points in our lives that call for humility and grace in defeat, we rarely reach these points in front of the entire world. More than 30 million people watched Game 7 of the 2016 NBA Finals, the most since Jordan’s final Bulls game in 1998. The rafters were full of blue and gold confetti waiting to fall on the unanimous MVP and his teammates. There was a parade route mapped out already. And for the third game in a row, boxes of “2015-2016 NBA Championship Warriors” shirts were tucked in the corners of gift shops, never to be opened. Fans filed out of Oracle Arena, somber and morose after a loss for only the fifth time all year. But injuries won’t excuse what happened in Game 7. That Pass, plus the inability to shake Kevin Love, and Irving nailing the game-winner in his face will haunt him no matter how many titles he goes on to win. Because Curry has always been able to shut people up. When he was called “too small” at Davidson, he found ways to win. I remember in 2008 when Davidson played Wisconsin in the Sweet 16. It was assumed their defensive specialist Michael Flowers would shut him down. I saw reports that Curry would have trouble scoring and I saw his dismayed reaction to the reports. Then I saw him score 33 points. When NBA layers voted James Harden their MVP in 2014-2015, Curry came back with the biggest improvement between MVP seasons in NBA history. I could see how much he wanted to shove it back in James’ face after the now-infamous block and staredown. I saw the frustration when those daggers he usually hits didn’t go in. This is uncharted territory for Curry.